For those of you who were unaware, there are a lot of folks who collect pins from various things. Just look at folks walking around Disney collecting and trading pins with folks. 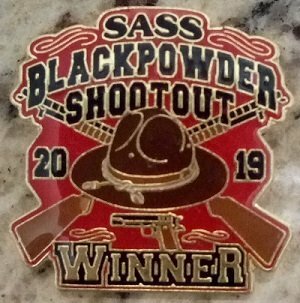 I always look forward to some of the SASS Blackpowder Shootout pins that come out each year. Pale Ale Rider used back powder ammo at the first Carolina Wild Bunch Shootout which was two years ago. 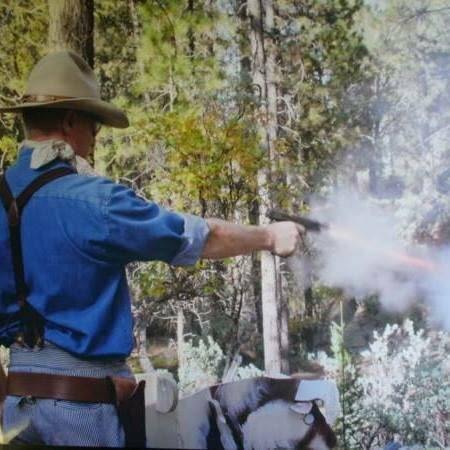 It was the first time I had seen a 1911 running black powder; it ran without a hitch. Lots of fun. Shooting black powder out of a 1911 makes John M Browning spin in his grave. The horror! Bill Carson shoots WB. When they ask him which category, he answers, "Frontier Cartridge!" Only person I ever seen shooting BP out of a 1911 was Split Rail several years ago. Cleaning it was probably a pain tho. Actually they aren't that hard to clean as the brass is very thin and seals the chamber well. At least on mine it does. Seen videos. Amazing enough BP fits to run well. I wonder if subs would work as well? That's almost as bad as shooting smokiless in a 73. This discussion made me wonder when BP was no longer used. 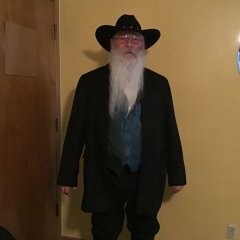 I found, according to Wikipedia https://en.wikipedia.org/wiki/Timeline_of_the_gunpowder_age, that in 1902, "Smokeless powder is adopted nearly everywhere in the world and "black powder" is relegated to hobbyist usage. So ends the Gunpowder Age." As the WBAS timeline starts with the 1911, BP doesn't seem to fit the category. As﻿ the WBAS timeline starts with the 1911, BP doesn't ﻿﻿seem to fi﻿t the category. True but it sure looks like a lot of fun. When I was 13 years old I was using BP shells in a 10ga dble with Damascus barrels for Pheasant hunting. Not a hobby used tyo put meat on the table. That was quite a while after 1902, at least 20+ years. It is. It also increases the difficulty factor by a great deal. Both in trying to see targets and in getting a load that meets the pf and in getting your gun to run for 60 plus rnds successfully per stage. Per KId Rich's post: We considered (very briefly) outlawing the use of BP or substitutes in Wild Bunch primarily because of the firearm problems the majority of users were having and the effect on the overall match flow. HOWEVER Wild Bunch Action Shooting is a SHOOTING match, and we want to reduce penalties and restrictions, not increase them. So we decided that if you can make it work fine, if you can't, you might miss a couple of stages as the match goes on. We (the WBAS Committee) have removed over a dozen MSV's and SDQ's since the start of Sanctioned WBAS competition. Too bad CAS can't do that also. OK, that is hilarious. I didn't pay close attention to what was on the pin until you pointed it out. Wonder if BP 45acp meets the power fastore? Ya...I found it funny that SASS decided to feature 2 trench guns and a 1911 on this year's BP championship pin, too. It’s obviously a mistake that wasn’t caught. Just for grins, I loaded up a couple dozen rounds of 230 gr RN and Pyrodex to see if it would work in my Springfield Armory GI 45. No problems at all. All rounds chambered, fired and ejected as normal. I did notice the slide was moving a bit slower than normal right from the beginning, but that was all. Dusty, do you have a chronograph? My loads were tested by HJ at the Regional in St. George, Utah a couple of years ago. With a 230g bullet the first round was about 720 fps the subsequent rounds were in excess of 750 fps. BP was a lot of fun to shoot in WB, cleaning was pretty easy, unfortunately I did find a couple mags that missed the cleaning part at the next WB match. BP soot does interfere with loading. Black powder in Wild bunch almost oughta be like a B western category. That video of Pale Ale Rider reminded me of how much smoke guns always make in the movies. Unfortunately no, but that would have been a good idea to have, and see how the velocity was. These were full charge loads, no filler. How did you keep an eye on the pheasant? I learned quickly that you let em get out a little ways before ya shoot em or there isn't much left to eat.